Nevada is one of the most unique offensive teams in the country due to their supersized perimeter lineup and a coach in Eric Musselman who runs more NBA G-League style sets than what we are used to seeing in a prototypical college system. Given how different the Wolf Pack attack is I thought they warranted a deeper look into how each one of their biggest offensive threats is used. Here is an individual offensive breakdown of some of Nevada’s biggest weapons. Nevada’s leading scorer at 19.2 points per game, I thought Caleb Martin should be the first player to take a look at. The first thing I notice when I look at his stats is that his field goal percentage of 41.7% is noticeably low relative to his teammates. In a vacuum that 41.7% isn’t that bad but when you consider how efficient Nevada is offensively shooting 46.5% as a team Caleb sticks out as one of the lower-percentage players. His inefficiency at times comes largely from the fact he loves pull-up jumpers off the dribble, something that at times Florida should definitely be okay with. In the midrange he’s shooting 38.2%, and most of his makes are from the free throw line range. When he goes between 17 feet and the 3-point line his percentage dips to 13.3%, so anytime he wants to settle for a long two the Gators should be happy. Eric Musselman loves to find mismatches and isolate his bigger wings against lesser defenders and Caleb Martin is a player that gets used this way a ton. When I looked at his isolation possessions I found some things that were pretty interesting to me. First off, when he gets the ball in isolation he’s looking to shoot, not drive. A whopping 65% of his isolations ended in no-drive jump shots, a crazy number that shows when he gets the ball in space he’s mostly looking to just measure up the rim to take a jump shot. He has an affective field goal percentage (field goal percentage that adjusts for the added value of the 3-point shot) of 49.2% when he does a no-drive jumper in isolation so it’s a pretty decent shot and I understand why he hunts it. When he does drive the ball he has an affective field goal percentage of 42.3%, a number that’s not too bad but it’s not one that’s devastating. When planning a defense against Caleb they should know he’s a shooter first and foremost and they shouldn’t worry as much about stacking help side defenders in the paint and leaving shooters open. They could definitely have some success allowing contested jump shots and seeing how things shake out. Another way Caleb Martin is used heavily is in the pick and roll. Not a super elite athlete, a ball screen is often the best way to free him up when he’s being hounded by better defenders. He is really good as using these ball screens and while he likes to pull jump shots off them as you’d imagine he actually drives a good amount more than he does in isolation. Shooting 57.9% when driving to the hoop off a ball screen versus shooting 30% when taking a jump shot off a ball screen, Caleb is much deadlier driving the basketball on these plays but is still going to settle for the jump shot more than he’s going to drive (50% of the time versus 36.3% of the time). Florida’s switching ball screen defense needs to be active when Martin gets a screen. Switching the ball screen should naturally take away the drive, but they’ll need to do it actively to eliminate an open jumper as he sits behind the screen. If they actively jump to the ball on these switches, they could be okay. Off the ball, Caleb is not a catch and shoot threat shooting 33.8% on those jumpers. He’s a guy that needs the ball in his hands to get his rhythm and if someone else is running the show and Caleb is spacing the floor in the corner, he’s a guy you can try your luck with leaving. To summarize Caleb Martin—he loves the jump shot and to be honest, Florida can live with a lot of the shots he takes. He doesn’t drive nearly as much as he should and the Gators should be aware of that and know what he’s looking to do when he gets the ball. 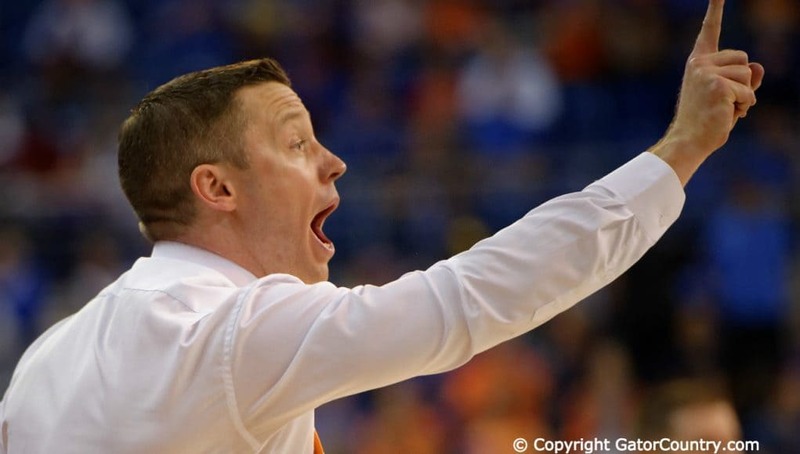 Cody Martin and Caleb Martin might be tough to tell the difference between by how they look but they do play differently and Florida needs to be aware of it. 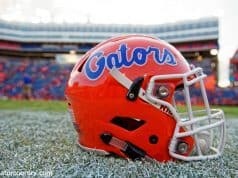 They will isolate Cody a good amount as well but is not nearly as dangerous as Caleb and the Gators need to be aware of it. He’s only shooting 28.1% when tasked with breaking a player down one on one and he’s only shooting 23.1% when shooting a no-drive jumper, a stark difference from his brother Caleb who loves the no-drive jumper and is good at hitting them. I know telling them apart in the moment could be a challenge but the difference in skill between the two at shooting those shots is major. While he’s not a good pull-up shooter in isolation like his brother, Cody is a better pull-up shooter off the pick and roll. Shooting an affective field goal percentage of 47.9% off pick and roll it’s an efficient shot for him but it’s not the only thing the Gators need to be aware of. He’s at a 78.6% clip going to the basket on screen and rolls, so he’s obviously incredibly dangerous when he gets there. Okay, let’s summarize because I know keeping the twins separated is difficult. Another area where Cody is different from Caleb is that fact that Cody is a far more efficient catch and shoot player hitting 47.2% of those shots, putting him in elite company in college basketball. The fact that Cody is a dangerous catch and shoot player while Caleb is below average is perhaps the biggest difference between the two players and it’s something the Gators will have to make a major note of. It should be noted that Cody hasn’t taken a high volume of catch and shoot jumpers which would suggest he probably isn’t quite as deadly as that percentage would indicate, but if he gets a good look it’s probably a high value shot. Caleb: Not a catch and shoot threat. Cody: Catch and shoot threat. Nailing the difference between the Martin brothers isn’t going to be easy but I think it should be extremely important in Florida’s scout. A powerfully built 6’7”, 230 pound forward, Jordan Caroline is a versatile athlete who is incredibly important to Nevada’s success, evidenced by the fact that the Wolf Pack lost to San Diego State without him in the Mountain West Tournament. 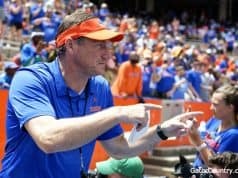 All the buzz is that he’ll be totally good to go against Florida which is bad news for the Gators who do not have the forward depth to match up with all the size of Nevada’s perimeter. Nevada’s best rebounder with 9.6 boards per game, Caroline loves to secure the defensive glass and part of the reason why is so that he can start the break himself. An absolute torpedo when he gets going in transition, he is extremely good at going coast to coast and laying the ball in through contact. Shooting 70.7% when he gets there he is an absolute load to handle and the Gators need to get the ball out of his hands before they need to try to stop him at the hoop while backtracking, a recipe for and-1s. Every piece of Nevada’s core has a unique skill set whether it’s Caleb Martin’s pull-up game in isolation or Cody Martin’s arsenal coming off picks and for Jordan Caroline it’s the ability to score off cuts, a forgotten skill in today’s day and age where generating open looks far from the hoop is the current trend. Knowing that Caleb and Cody are going to generate a lot of attention when they have the ball, Caroline moves intelligently on the weak side of the floor and works into open spaces where he can look to receive the ball and finish. Florida needs to be aware of him off the ball as he is always looking to face cut (cut in front of) his defender, allowing for the ball to be delivered to him deep in the paint so he can turn and finish. Scoring off cuts is always highly efficient basketball and it’s no different for Caroline who is shooting 60.3% on these high-value shots. Eric Musselman’s iso-heavy offense utilizes Caroline in this area as well and though he’s not used as much as the Martin twins the Gators will have to be ready for him to isolate as I’m guessing it’s a matchup Musselman is going to like with Jalen Hudson likely having to guard Caroline for stretches. If Hudson does find himself guarding Caroline in space he should know that his right hand is much, much better than his left. Currently shooting 73.3% while driving to his right, that is by far his strength while going left is much less efficient at 33.3%. If you get guarding him in space, you know what to do Jalen. One other thing I have to mention about Caroline is the fact that if he gets an offensive rebound, he’s going up with it. 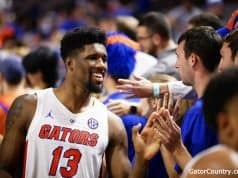 He has taken more offensive rebound put back shots than anyone I have seen in college basketball this year with 81 and given the fact that put back opportunities are always close to the hoop these are efficient shots and with Caroline making 60% of them the Gators will have to dig down on him when he gets an O-board. The one player without plus size in the Nevada rotation is 5’10” Jazz Johnson who changes the complexion of the game with his shooting ability. Ripping the mesh at 45% from behind the arc this season Johnson is an absolute flamethrower and is one of the best marksmen in college basketball. When guarding his shots getting a hand up to contest is always preferable but it actually doesn’t seem to matter all that much to him as he’s been shooting 46% on open threes and 44% on guarded threes. Clearly when it comes to Johnson it’s not about closing out to his shots but trying to eliminate them altogether. If Florida ever needs to go double someone like Caleb Martin or Jordan Caroline the guy you don’t want to leave is Jazz Johnson and considering the rest of the Wolf Pack are mediocre shooters they should probably try their luck leaving anyone else. He also has a smooth 60% pull-up, something he often utilizes coming off pick and rolls. He hasn’t taken a ton of those shots this year so you probably don’t have to think too much about that and instead need to focus on not allowing him to catch and shoot. Despite being 5’10” Johnson isn’t particularly quick, more of a spot up shooting guard trapped in a stocky point guard’s body. That means they don’t use him a lot in isolation like they do a lot of their other key players, though if he does drive in space there’s something you should know. He can’t shoot when he drives right. Okay, maybe that’s strong wording saying that he can’t, I guess I mean he won’t. Well, more accurately, he is yet to take a shot while driving right in isolation. Every single time he’s gotten a defender in space and driven right, he passes the ball off. He’s clearly more comfortable with his shot fading towards the left, which many right-handed shooters are, and the players guarding him should probably know that. Johnson doesn’t isolate a ton so it’s not like this situation will come up a lot but Florida forces a lot of late shot clocks and if Johnson is in a position where he’s going to need to put up a jumper at the buzzer the Gators should force him right. Nevada is a potent offensive team and a lot of it comes from the fact they have so many unique pieces and a style that uses a lot of one on one play. With a full season of sample size I hope I helped you learn some of the Wolf Pack’s tendencies before the Gators take them on Thursday. Eric hails from Edmonton, Alberta, Canada. His blend of sports and comedy has landed his words on ESPN, Bleacher Report, CBS Sports, Lindy's and others. He loves zone defenses, the extra pass, and a 30 second shot clock. Growing up in Canada, an American channel showing SEC basketball games was his first exposure to Gator hoops, and he has been hooked ever since. You can follow him on Twitter at @Efawcett7. Thanks for the analysis. Always enjoy your work.